Robert Lamont ORMSBY was born at 19 Regent Place, Shawlands, Glasgow, Renfrew, Scotland on 5 March 1892 to Henry ORMSBY and his wife Mary Jane LAMONT. His mother died five days after his birth and Robert went to live with his maternal grandmother Isabela LAMONT in Lockfoot Village, Kirkcudbright, Scotland for the first few years of his life. The 1911 census found Henry, 19, a medical student, at Gibbsyard, Ayr with his father Henry, brother James [James Henry ORMSBY], Uncle Andrew [Andrew ORMSBY] and grandmother Helen Ormsby [Helen STEEL]. Three months after the census was taken his brother James went to Singapore to where he worked for the Heap Eng Moh Steamship Company, a large operation which provided cargo and passenger services to Malaysia and the South Seas area. It is likely that James wanted Robert to join him. About 1912 Robert left his medical studies and enlisted in the Officers’ Training Corps (OTC) at Glasgow University. He also heard from his brother James, in Singapore, about the opportunities for work and advancement in that area of the world. Robert became interested in the rubber industry and saw that as a potential career in Southeast Asia. The growing popularity and mass production of the motorcar, such as the Model T, created a significant demand for tires. Bankers and wealthy industrialists, including those in Scotland, were keen to exploit this demand. ‘Rubber planters’ usually educated men, were hired by estate owners to manage the rubber plantations in Southeast Asia, particularly Malaysia. Newspapers of the time reported on the new industry and no doubt the opportunity for financial reward was discussed in the pubs and among the OTC students. And Robert’s brother James was already in Singapore. Robert made his decision – he would leave Scotland’s damp climate and limited job opportunities, join his brother and become a rubber planter. He booked his passage to Singapore for June 1913. But first he attended to a personal matter. On 10 June 1913, three days before he sailed, Robert, 21, occupation listed as ‘rubber planter’, married Isabella Thow TURNER, 25, a governess from Mauchline, Ayrshire. Isabella had grown up in St. Quivox the same parish as Robert; likely their families had been neighbours and they had known each other in childhood. They married in Glasgow, using a Sheriff’s Warrant license rather than go through the slower process of posting marriage banns. Perhaps they wanted to be married before Robert emigrated so that it would be easier for Isabella to join him once he was settled. On June 13, 1913 Robert sailed from London to Singapore on the P&O ship Mongolia. In August 1914, little more than a year after Robert left Scotland, World War I (WWI) broke out. Britain and her colonies were at war and thousands of patriotic men and women enlisted; Robert was one of these. Isabella did not see Robert for another four years. On January 1, 1915 five months after the declaration of war, Robert enlisted in the Australian Imperial Force (AIF) at Blackboy Hill, Western Australia. It is not known whether Robert went to Western Australia purposely to enlist, or whether he was on leave after a spell in the tropical regions of Malaya as Western Australia has a dryer Mediterranean climate. There is no evidence that there were any rubber estates in Western Australia where he could work as a rubber planter. In his attestation papers he cited his previous service with the OTC from Glasgow University. Robert named his father Henry as next of kin, an indication that the Australian army did not recognize his marriage to Isabella since it was conducted outside the church. Shortly after Robert enlisted he sailed for the Middle East where he served with the ‘Unit 4th Reinforcement to the 16th Battalion’ in the Gallipoli Peninsular campaign – a campaign that was a disastrous failure. Of the estimated over 250,000 allied casualties at Gallipoli, approximately half were due to sickness, chiefly dysentery, diarrhoea and enteric fever. Improper hygiene, poor sanitation and a breakdown in supply lines were exacerbated by the terrain and close fighting which did not allow for the dead to be buried. Flies and other vermin flourished in the heat, which caused epidemic sickness. Robert was one of the casualties of disease and was declared unfit due to enteric fever. He convalesced on the Royal Navy hospital ship ‘Somalia’ and military hospitals at Alexandria and Cairo, Egypt. Robert returned to the Blackboy Hill military camp by August 21, 1916. Declared ‘temporarily unfit’, he served on home service duties in Australia, address Forest Street, Freemantle, Western Australia. After five months Robert recovered. The war was going badly for the allies and there was a great need for men for the battlefields of France. On January 15, 1917 again at Blackboy Hill, Robert joined the 1st Anzac Corps Salvage Section, a group that recovered equipment from the battlefield. Robert listed Isabella as next of kin, although identified her as ‘a friend’ another indication that the Australian Army did not recognize the marriage. In order to ensure Isabella’s widow’s pension if Robert was killed in action the marriage needed to be formalized. Robert arrived in the UK by March 1917. He was posted to Darrington, Salisbury Plains, Wiltshire, England. In early March he went ‘absent without leave’ for ten days. It seems likely that he travelled to Mauchline to see Isabella and arranged to be married in church to ensure the legality of Isabella’s position as his wife. As a penalty for his absence without permission Robert was sentenced March 21, 1917 to eleven days detention and forfeited 22 day’s pay. Although planned in March the marriage did not occur for five months as wartime marriages of military personnel were time consuming to arrange, particularly in this situation. First Robert spent his ten days in detention and possibly some time being confined to barracks. Then Robert requested permission to marry from his Commanding Officer and then requested leave to do so. Arrangements with the church took time as the banns had to be read on three successive Sundays. On August 17, 1917, the formalities completed, Isabella and Robert married in Mauchline, Ayrshire. In the eyes both of the church and AIF “Mrs I. Ormsby (Wife), Ayrshire, Scotland” was Robert’s next of kin. In early October 1917 Robert sailed for France and carried out his duties of battle field equipment salvage. He did not return to the UK until March 1919 when he was admitted to King George’s Hospital in London as an Influenza casualty. He was discharged from the AIF in London on May 14, 1919. 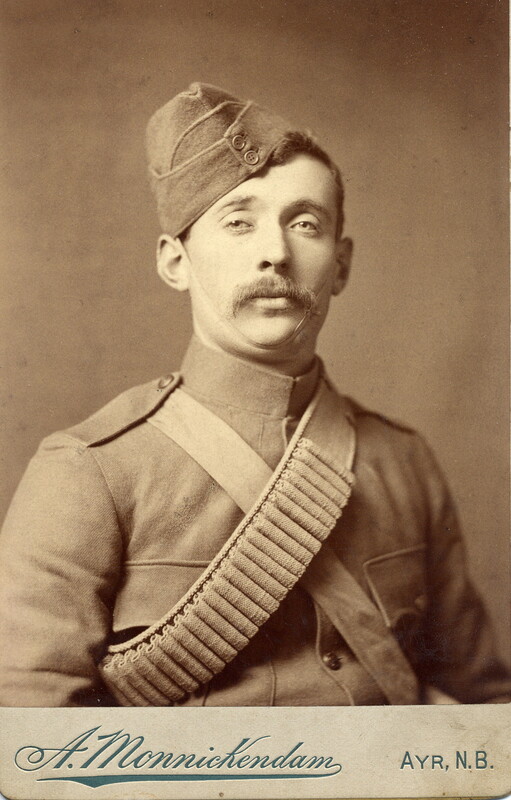 For his war service Robert was issued three medals: the 1914/15 Star; the British War Medal (BWM); and the Victory Medal (VM). There is no sign that Robert returned to rubber planting or southeast Asia after the war. Neither Robert nor Isabella appear in the records of passengers leaving the UK. He may have turned to a career as a journalist. At the time of Isabella’s death on February 15, 1947 she was ‘widow of Robert Lamont Ormsby, journalist’. Death information for Robert has not been found in a search of the Scottish records. A death record for a ‘Robert L. Ormsby’, in Pancras, London in 1937 requires further research. Robert and Isabella may have had a daughter in 1928. Hopefully a family member or descendent will see this and help add more information so that Robert and Isabella can continue to tell more of TheirOwnStory. James Henry ORMSBY was born 18 January 1890 in McLellan St., Dumfries, Dumfriesshire, Scotland to Henry ORMSBY and his wife Mary Jane LAMONT. After his mother’s death in 1892, he lived with his father, Uncle Andrew Ormsby [Andrew ORMSBY] and paternal grandmother Helen Ormsby [Helen STEEL] at Gibbsyard in Ayr. He attended a four year Mechanical Engineering course at Glasgow Technical College. Upon completion of five years apprenticeship in mechanical engineering (steam, internal combustion, gas) by 1911 James, 21, was a Marine Engineer. At some point he also took a seven month ‘aeroplane construction including aero engines’ course. In September 1911 James went to Singapore in the Straits Settlements, a separate Crown colony, directly overseen by the Colonial Office in London. At the time Singapore had established itself as an important trading port and developed into a major city with rapid increase in population. In Singapore James worked for the Heap Eng Moh Steamship Company owned by Chinese millionaire Oei Tiong Ham known as the ‘Java Sugar King’ but his business was far more diverse than the title suggested as his ships traded rice, sugar, rubber, opium and other supplies throughout the region. It was a time of rapid expansion for the company which later was described as a ‘vast business empire’. James no doubt saw the potential for work and progress and likely encouraged his younger brother Robert [Robert Lamont ORMSBY] to join him in the region. James spent nearly three years in Singapore. During the time he also learned the local language as his military service records noted that he spoke “Malay, Chinese (Coolie)”. In July 1914, just a month before WWI broke out, James returned to Britain. In April 1915 James joined the Royal Naval Air Service (RNAS). He was appointed an Acceptance Officer at the Admiralty where he acted as an Observer and Inspector. He moved to Ealing, a borough of London, England and worked at the Admiralty office in Hotel Cecil, The Strand, London. Ealing was about a twenty minute ride from the Hotel Cecil where James was posted. On 18 December 18, 1915 James married Agnes Anderson DRUMMOND in Edinburgh according to a Sheriff’s Warrant. Agnes, born about 1889, was from Cupar, Fife, Scotland, the daughter of retired Marine Engineer David DRUMMOND and his wife Georgina DAVIDSON so it is likely that James met Agnes in Scotland through his work and social connections. James’ address at the time of his marriage was 41 The Avenue in Ealing, a building with flats or apartments. After their marriage Agnes moved to Ealing with James. On April 1, 1918 James transferred from the RNAS to the newly formed Royal Air Force (RAF). Service record phrases “NI”, ‘Section Air Dept”, “housed/working at the Hotel Cecil / HMS President” have led to the conclusion that James was in Naval Intelligence (NI) based at the Admiralty. The Hotel Cecil was requisitioned for the war effort and served as the headquarters for the newly formed RAF and ‘HMS President’ was used to designate the Admiralty. A daughter [still alive?] was born to James and Agnes in Dundee, Scotland March 23, 1918. Agnes’ address on April 1, 1918 was still in Ealing so it is likely she had returned to Scotland to her family or friends for the birth. Sometime toward the end of WWI, James was posted to Dundee, Scotland. On January 1, 1920 Captain James Henry Ormsby left the RAF. He was awarded a British War Medal for his WWI efforts. Generally this medal was awarded only to those who had served outside the UK, however exceptions were sometimes made for particular services. After James left the RAF he and his family lived at 1 St. Johns Wood Terrace, Park Rd, Dundee, Scotland. Post war work may have been difficult to find and he looked for overseas opportunities. He sailed from London for Sydney, New South Wales (NSW), Australia on September 7, 1922 on the P&O ship S. S. Bendigo. He arrived in Sydney November 2, 1922. Agnes and her five year old daughter followed him to Sydney June 19, 1923. Their address when they left Scotland was 3 Gowrie St., Dundee. NSW Electoral Rolls, 1930 to 1980, provide a picture of the family in Australia. James and Agnes lived at 14 Clifford St., in Parramatta, NSW from 1930 – 1954. James is listed as ‘engineer’ with no indication whether he used the ‘marine’ aspect of his qualifications, however the Paramatta River is the main tributary of Sydney Harbour so it would have been natural for him to do so. James died in 1956, presumably in Parramatta. From 1958-1963 Agnes lived at Taylor Street, West Pennant Hills, Castle Hill, Mitchell, NSW with her daughter and son-in-law. Agnes died in 1964. It is not known whether any children were born to James and Agnes in Australia. Hopefully this blog will reach descendants of James and Agnes Ormsby and information can be added to their story. Henry ORMSBY, born on 19 February 1859 at Brickrow Farm St. Quivox & Newton, Ayrshire, Scotland, was the youngest of James ORMSBY and his wife Helen STEEL’s seven children. His father, James, was not home at the time of his birth, although there is no indication where he was; perhaps in Ireland, or at a cattle sale elsewhere in Scotland. The decision about a career or job was important and Henry watched the choices made by his four older brothers. Like his older brother Richard [Richard Steele ORMSBY] (and maybe James [James ORMSBY]), Henry decided that farming was not for him. He chose a life at sea and had ample opportunity for apprenticeships and training in the seaport town of Ayr. By 1881 Henry, 22, lived in Tynemouth, Northumberland, England as an unemployed marine engineer, perhaps still an apprentice. By 1887 at the time of his marriage Henry had attained his Master’s Engineering ticket. On 02 September 1887 in Kirkbean, Kirkcudbright, Scotland, Henry married Mary Jane LAMONT. Mary Jane was born May 26, 1863 in Bankhead, Dalry, Ayrshire, Scotland to Robert LAMONT and Isabella HOWIE. Henry and Mary Jane had two sons, James Henry ORSMBY (born in Dumfries 18 January 1890) and Robert Lamont ORMSBY (born in Glasgow 5 March 1892). On 10 March 1892, five days after Robert’s birth, Mary Jane died at 19 Regent Place, Shawlands, Glasgow. She is buried in St. Quivox, Ayrshire churchyard in one of the Ormsby family graves. After Mary Jane’s death Henry moved home with his sons where he had family to help raise them. His work as a marine engineer likely required him to be away for extended periods. In the 1911 census he lived at Gibbsyard with his mother (89), his brother Andrew (63) and his two sons. This census identified that at age 52 Henry had retired. Photo left, standing, left to right is Henry and Thomas WATSON. Sitting left to right is Henry’s niece Helen (Nellie) McNab Steel ORMSBY and an unknown woman, possibly another niece, a MUIR cousin. This is the only known photo of Henry. The photograph was likely taken in Ayr, Ayrshire as there is no record of Nelly having travelled. The date is prior to 1912 as Thomas Watson, a chauffeur, immigrated to Canada in 1912. Photo is from the collection of Donald Slater, (for Donald’s other family photos see www.flickr.com/photos/palaeoecogeek). On 4 June 1913, at 121 High Street in Ayr, widower Henry married Katherine MUIR, the daughter of Thomas MUIR and his wife Jeanie CRAWFORD. Henry died at Bingham House in Richmond, Surrey, England on September 24th 1924. The reason he died in England is not known. Perhaps he and Katherine were visiting? Hopefully someone who sees this story will have more information on Henry and is family. Helen (Nelly) McNab Steel ORMSBY was born on 26 February 1895 at Brickrow Farm, St. Quivox, Ayrshire, Scotland, the first of John and Helen (Ramsay MUIR) ORMSBY’s children. She was named after both her maternal (Helen McNAB) and paternal (Helen STEEL) grandmothers, perhaps an indication that her parents had difficulty agreeing on a name. 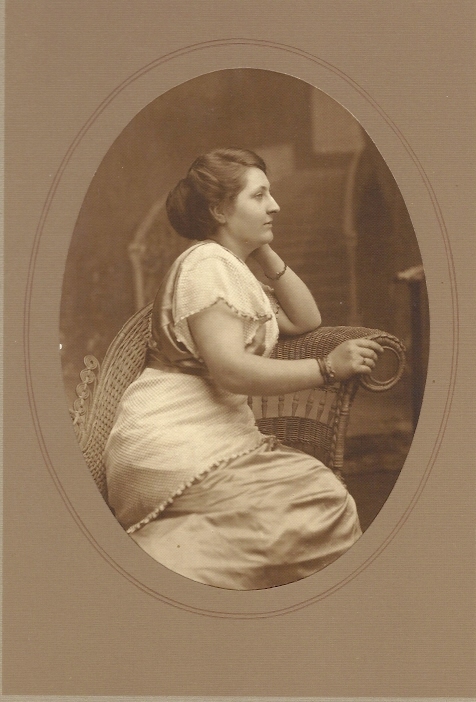 Right is a photograph of Helen – on the back of photo “Helen Ormsby, 1914” in her mother Helen’s hand writing. Helen (the daughter) was 19 years old in 1914. 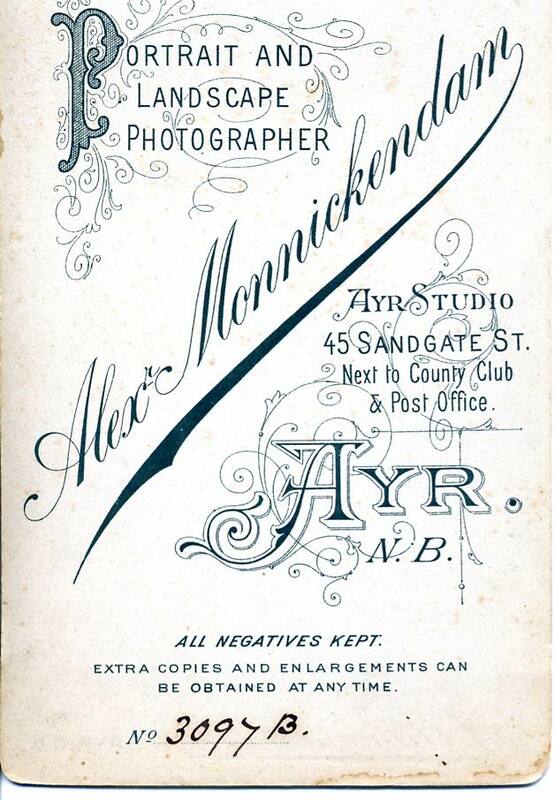 This portrait was taken at the Studio of Henderson & Son, Prestwick and Ayr. The photograph is from the collection of an Orsmby family descendant who still lives in Ayrshire, Scotland. 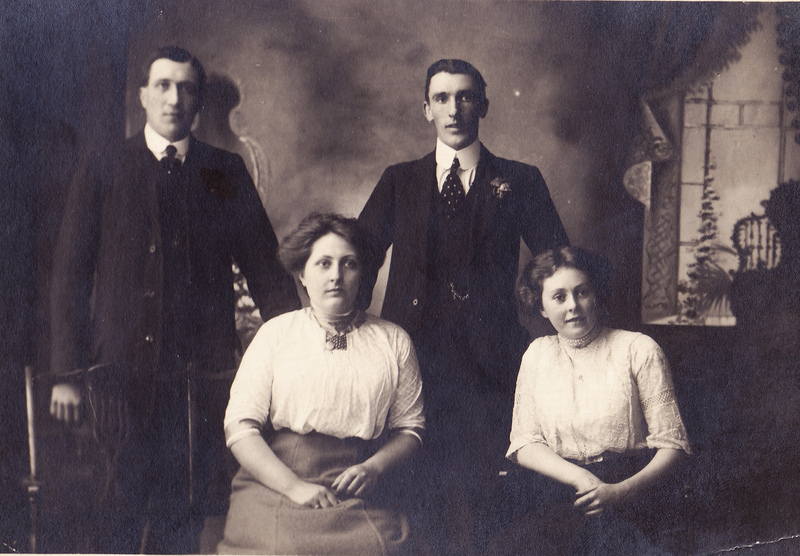 Photo left: standing, left to right is Nelly’s uncle Henry ORMSBY and her cousin Thomas WATSON. Nelly’s mother (Helen Ramsay (MUIR) ORMSBY) and Thomas’ mother (Jane (MUIR) WATSON) were sisters. Nelly is sitting on the left; to Nelly’s left is an unknown woman, possibly a MUIR cousin. The photograph was likely taken in Ayr, Ayrshire as there is no record of Nelly having travelled. The date is prior to 1912 as Thomas Watson, a chauffeur, immigrated to Canada in 1912. Photo is from the collection of Donald Slater, (for Donald’s other family photos see www.flickr.com/photos/palaeoecogeek). Known as ‘the cook’, Helen worked in Ayr as a cook and housekeeper. She never married and died, aged 81, on 26 August 1976 in Heathfield Hospital, Ayr, Ayrshire, Scotland of ‘pernicious anaemia’. 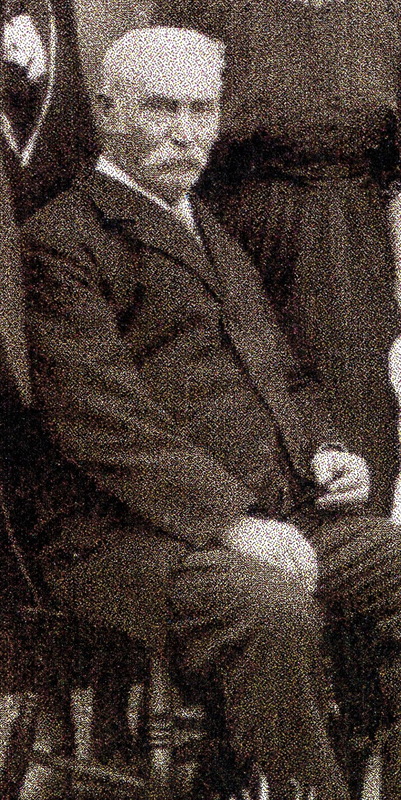 John (Pa) ORMSBY was born on 14 May 1856 on Brickrow Farm, St. Quivox, Ayrshire, Scotland. He was the second son named John to be born to James ORMSBY and his wife Helen STEEL since a younger son of the same name died in infancy. Giving a second child the same name as a deceased infant sibling was a not uncommon practice at the time. This was done to ensure that grandparents’ names were carried down the line of descendants. John was 15 when his father died in October 1871. John’s older brother Richard had already left home. If his older brother James was still at home he left shortly after, probably in November 1871 when he turned 21 and was able to claim the £100 endowment policy left to him by his father. Younger brother Henry was only 12 and still at school. Consequently it fell to John and his brother Andrew (23) to stay at home on Brickrow Farm and provide for the remaining family. Photo above: John Ormsby on 30 October 1924, Brickrow Farm, at the marriage of his daughter Jean to James Crawford McGuire. The photograph is from the collection of an Ormsby family descendant who still lives in Ayrshire, Scotland. For the twenty years between 1871 and 1891 John farmed and lived at the Ormsby home of Brickrow with his mother Helen and older siblings Helen and Andrew. Both the 1881 and 1891 census listed his mother Helen as the Head of the family. The family must have worked hard as Brickrow increased in size by 26 acres in the ten years after the death of John’s father in 1871. In 1881 the farming operation required a farm servant and a domestic servant, although by 1891 only one ‘general domestic servant’ was employed by the family. 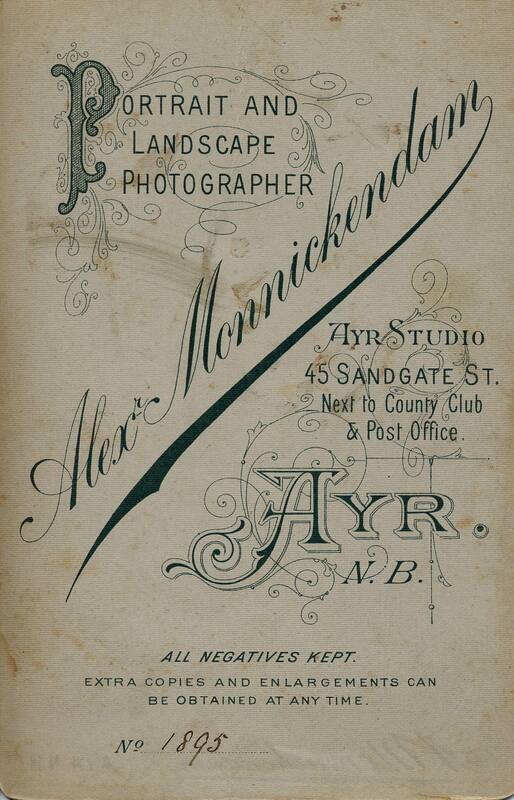 In 1894 John, 38, married 20 year old Helen Ramsay MUIR at her home of Mainholm Farm, Ayrshire. 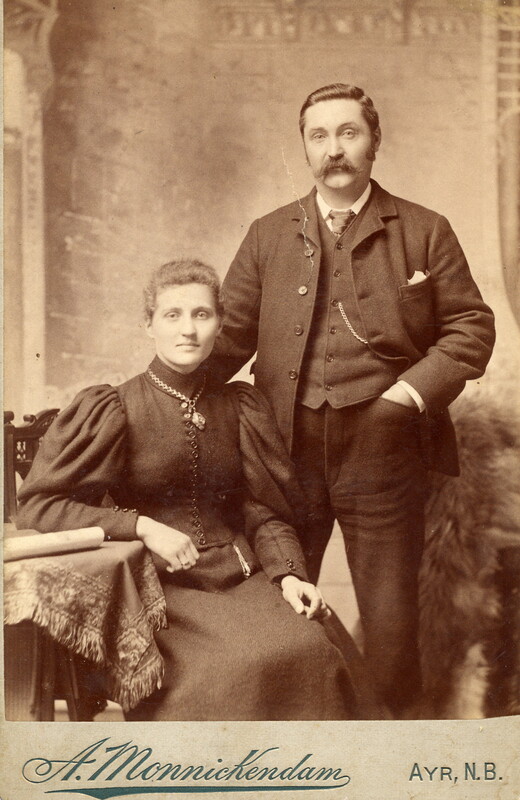 Richard Steele ORMSBY was born on 19 March 1853 in St. Quivox, (probably at Brickrow Farm), Ayrshire, Scotland, to tenant farmers James ORMSBY and his wife Helen STEEL. As the 5th child and 4th son of James and Helen, Richard would be expected to find work other than at Brickrow Farm, as that tenancy would likely be handed to the eldest son Andrew [Andrew ORMSBY]. Which may have suited Richard fine as it appears he never wanted to be a farmer. By age 17 in 1871 he was a ‘banker accountant’ and lived as a boarder with a family at Waterside Place in Cumnock, Ayrshire. Not content with the life of a bank clerk in Scotland, Richard dreamt of adventure and wanted to join in the gold rush to New Zealand where gold had been discovered in the Otago region on the South Island in the 1860s. The death of his father James on 12 October 1871 provided the means of accomplishing this plan. According to the inventory conducted at the time of his father’s death, Richard was the beneficiary of a £100 Endowment Policy with the St. Patricke Assurance Company of Ireland when he reached the age of 21 on 19 March 1874. By 1875 Richard, 22, lived and worked in Clinton, Otago, as a shop assistant for Scobie Brothers, storekeepers. One of his first memorable experiences, in 1876 in his adopted country, occurred when he acted as witness for his employer against a man accused of stealing “one dozen Crimean shirts valued at £7 10s”. The stolen shirts were “a large check, and heavy twilled shirt, of which there were six ordered black and white pattern and six red and white Rob Roy pattern”. Sometime between 1875 and 1880 Richard, who sought advancement, moved to Milton, an important and bustling town in early Otago. The town, located on the route to the goldfields, was also home to several large factories and industries. Since Milton was a major staging post for prospectors on their way to the gold fields of Central Otago it grew rapidly during the gold rush years. As an example, the congregation of the Tokomairiro Presbyterian Church had reached 4000 by the late 1870s. Richard’s employment in Milton is not known however he enjoyed a social life. On 25 August 1880 Richard married Alison SCOTT at the home of James SCOTT, likely Alison’s father. Immigrants arrived every day from around the world to take part in the gold rush and Dunedin, on the Otago Harbour, served as the entrance point for this influx. To live in Dunedin, the largest city in the country, was Richard’s goal. Richard and Alison had three children: Leslie James ORMSBY (born 1882), and twins Rupert Seggie ORMSBY and Lily ORMSBY (born 1886). Lily died at birth. At this point I don’t know whether the children were born in Milton, or after the family moved to Mornington, a suburb of Dunedin. Electoral Roll records for New Zealand provide a picture of the family. In 1890 Richard and Alison lived in Mornington. Richard, trained as a “banker accountant” had advanced to “confidential clerk to Sargood, Son and Ewen”, a large importing and warehousing business in Dunedin. Alison is not mentioned in the Electoral Roll for that year since women did not get the vote in New Zealand until 1893. Sargood, Son and Ewen was a large importing firm of a type common in New Zealand at the time. Due to the country’s distance from major supply centres importing merchants purchased or ‘indented’ a range of items from their agents and suppliers overseas, paid for and then sold locally with an increase in price to ensure a profit. Salesman or ‘travellers’ would visit local stores to sell the range of imported stock. The harbour city of Dunedin was the shipping and importing centre for this lucrative trade. One of the oldest and most prominent Australasian firms of this type was Sargood, Son and Ewen was, with branches in most major cities on both sides of the Tasman Sea and a London purchasing house. The company’s Dunedin branch, established in 1862, served as the head office for New Zealand. Richard’s position as confidential clerk in this prestigious firm was one of responsibility and he was entrusted to speak on behalf of the company. This he did in December 1890 when he gave evidence on behalf of his employer in the matter of a bankrupt customer who defaulted on payment. Tobacco, biscuits, glassware, boots, shoes, reels of cotton, saddles, straw hats, drapery stock, silks, satins and expensive dress pieces were some of the goods that had not been paid for. The accused man, Bernard Ginsberg, protested that he had had the money to pay, but that it “had been stolen from him in a brothel in Dunedin” and he had been too ashamed to tell the company the reason for his non-payment. By 1896 Richard achieved his ambition and lived in Dunedin, where he remained for the rest of his life. Between 1896 and 1906 the family moved three times in Dunedin. Was this to larger or smaller homes? While it’s not known whether Richard’s fortunes were going up or down something happened to the family. In 1911 Richard (58), an accountant, lived by himself at a fourth address in Dunedin. Alison (56) lived in Avon, a suburb of Christchurch with her sons Leslie (29) a mechanic, and Rupert (25) a shop assistant. During the WWI period 1914 to 1918 both Leslie and Rupert enlisted in the army. Leslie may have served overseas. Rupert was in the Reserves and did not leave New Zealand. From 1911 Alison lived in Avon, with both her sons until WWI, and then with Rupert after Leslie joined the army. She died, aged 65, in 1920 in Avon. Alison left a will registered in the Christchurch High Court, Christchurch which has not been checked at this time. Richard remained in Dunedin where he died, aged 69, in February 1922. He was buried in Anderson’s Bay Cemetery in Dunedin on February 11, 1922. He did not leave a will and is not mentioned in the family cemetery inscription in St. Quivox, Ayrshire, Scotland, even as an ‘in memoriam’ mention. Perhaps Richard had lost touch with his Scottish family? Newspaper sources: The National Library of New Zealand has scanned copies of archived newspapers. The newspaper accounts with reference to Richard can be found at http://paperspast.natlib.govt.nz/cgi-bin/paperspast, by searching the ‘exact phrase’ option’ using the phrase ‘Richard Steele Ormsby’. John ORMSBY born about 1851 in Brickrow Farm, St. Quivox, Ayrshire, Scotland, died about 1854-1855 in Brickrow Farm, St. Quivox, Ayrshire, Scotland. He was the fourth child and third son of James ORMSBY and his wife Helen STEEL. Very little is known about John aside from the St. Quivox cemetery inscription “Erected by Helen Steele in memory of … her son John who died in infancy”. His birth and death are not recorded in the St. Quivox Old Parochial Records. Childhood diseases such as cholera, diphtheria, whooping cough, typhus, smallpox and tuberculosis were prevalent and may have caused John’s death. The baby John probably died about 1854-1855 as the next son born to James and Helen in 1853 was named Richard Steel ORMSBY so John was likely still alive. When the next son after Richard was born in 1856 he was named John [John ORMSBY] as a replacement for his deceased infant brother. Another possible explanation is that John was stillborn, as stillborn children often went unregistered and had no burial ceremony, although in that situation the next son would have likely been named ‘John’ instead of ‘Richard’. Andrew ORMSBY was born on 19 August 1848 in St. Quivox, Ayrshire, Scotland, the first son and second child born to James ORMSBY and his wife Helen STEEL. Left: Andrew Ormsby, at Brickrow Farm, Ayrshire, Scotland, on 30 October 1924 at the wedding of his niece Jane (Jean) Muir ORMSBY to James McGUIRE. This photograph is now in the collection of an Ormsby family descendant who still lives in Ayrshire, Scotland. Andrew lived an uneventful life at Brickrow Farm and a short distance away at Gibbsyard. The census recorded Brickrow Farm as his residence and listed his occupation as ‘farmer’, ‘agricultural labourer’ or ‘farm labourer’. For a brief period he considered leaving farm work as the 1871 census listed his occupation as ‘clerk’. Perhaps it was the death of Andrew’s father on October 12, 1871 that altered Andrew’s career choice and he was required to help run Brickrow Farm with his widowed mother Helen and his younger brother John [John ORMSBY], 15. Andrew likely had no option but to return to farming. His brother Richard Steele [Richard Steel ORMSBY] had already left home and his brother James [James ORMSBY], who reached the age of 21 on 16 November 1871, had received the £100 from his father’s will and had no intention of staying on the farm. Andrew was not mentioned in his father’s will, perhaps it was assumed he would take over the running of Brickrow Farm. Whatever the situation, by 1881 Andrew was listed as a ‘farmer’ and so was to remain for the rest of his life. 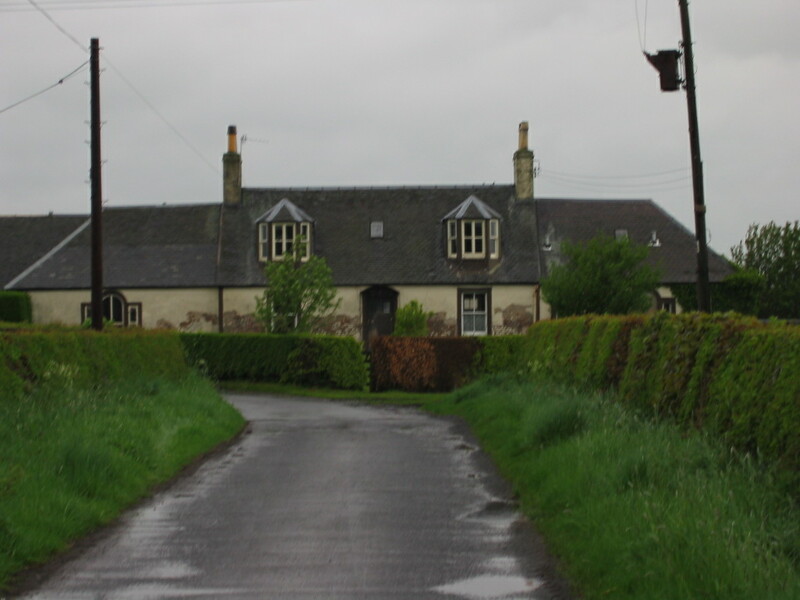 Andrew lived at Gibbsyard, Auchincruive from 1901 until at least 1913. The move to Gibbsyard likely occurred after Andrew’s brother John brought his new wife Helen Ramsay MUIR to Brickrow in 1894. The 1911 census listed Andrew (61) sharing a home at Giibsyard with his widowed mother Helen (89), widower brother Henry [Henry ORMSBY] (52) and Henry’s two sons James [James Henry ORMSBY] (21) and Robert [Robert Lamont ORMSBY] (19). In 1913 Andrew, as eldest son, signed the death registration of his 92 year old mother Helen. Sometime after 1913 Andrew moved back to Brickrow Farm and continued to help his brother John and family with farming activities. He died there on 07 January 1928, 79 years old of ‘heart disease’’ only three months after his brother John. Helen ORMSBY was born on 19 July 1846 in St. Quivox, Ayrshire, Scotland, and died 18 February 1905 in Gibbsyard, Ayr, Ayrshire, Scotland. Helen was the eldest child of James ORMSBY and his wife Helen STEEL. The St. Quivox Old Parochial Record (OPR) listed her, although the handwriting doesn’t make clear whether she was born or baptised on the19 July of 1846. The forty years covered by census records from 1851 to 1891 recorded that Helen lived at Brickrow Farm with her parents and then her widowed mother and siblings after her father’s death. She attended school for the first sixteen years of her life and then after the 1871 census her occupation, listed as ‘farmer’s daughter’, indicated she worked on farm activities at Brickrow (cooking, tending the kitchen vegetable garden, feeding the animals and chickens, working as a dairy maid and so on) . Photo above: Brickrow Farm; this photograph is now in the collection of an Ormsby family descendant who still lives in Ayrshire, Scotland. By the 1901 census Helen, (no occupation given), her mother [Helen STEEL] , brothers Andrew [Andrew ORSMBY] and Henry [Henry ORMSBY] and 10 year nephew James Henry [James Henry ORMSBY] lived at Gibbsyard, Auchincruive. They likely moved there at the time of the marriage of Helen’s brother John [John ORSMBY] to Helen Ramsay Muir [Helen Ramsay MUIR] in 1894. Helen, 59, died at Gibbsyard in 1905 of ‘acute bronchitis’, some days’. She predeceased her mother by eight years. The informant of her death was her brother John who lived a short distance away at Brickrow Farm.